If you’re a cat owner, you’ll almost definitely have been frustrated by your cat’s tendency to scratch furniture and other belongings. The average cat does a lot of scratching, particularly for marking his or her territory and sharpening their claws. Because this is a natural and instinctive behaviour, you’ll be fighting a losing battle if you try to teach your cat to stop scratching altogether. Instead, you stand a much better chance of success if you look to teach your pet when and where it is appropriate to engage in scratching. Here are our tips for tackling your cat’s destructive scratching. Scratching posts are a useful way to teach “appropriate” scratching behaviour. Choose a range of surface options, such as carpet, sisal and upholstery. Vertical and horizontal posts are available and you may have to trial both types to gauge your cat’s preferences. Catnip can act as an incentive for using scratching posts, as can toys. Discourage “inappropriate” scratching by making favourite hotspots a no-go zone. Cover these areas with things that your cat will find unappealing, such as double-sided sticky tape or foil, or use negative smells that will discourage scratching. Scratching posts should then be positioned in close proximity as an alternative scratching option. It is preferable to keep them close to desired scratching locations, at least until your cat has been using scratching posts on a regular basis. If you catch your cat mid-scratch, use a squirt of water to startle him or her into stopping. This shouldn’t be an early tactic though as it may encourage your cat to be scared of you. You may find it useful to trim your cat’s claws regularly so that he or she is less inclined to us scratching to keep their claws in great condition. This will also mean that he or she causes less damage via scratching. If you are not confident doing this, ask your vet or vet nurse to help. Never try to force your cat to use a scratching post. Some cat owners mistakenly believe that this will encourage usage but it’s much more likely to frighten your cat and make him or her even more reluctant to use it. Don’t be tempted to use interaction such as shouting to make your cat stop scratching. While he or she may avoid scratching while you’re nearby, it won’t discourage them from doing so while you’re not around. Have you been able to encourage your cat to stop inappropriate scratching? Share your tips in the comments section below! I’m interested that you suggest trimming claws as our old vet who retired used to trim Oscar’s claws regularly, but the new, younger, vet refuses to do so as he says it is cruel and could cause the cat to fall or come off worse in a fight. Meanwhile…..my carpets and furniture are wrecked! What do0 others find? It’s a question of context. 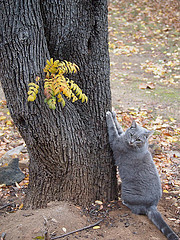 If your cat is a particularly outdoor cat and is likely to be climbing trees and getting into fights, then the front claws particularly are important to help it climb safely and defend itself. In this case I would avoid trimming claws and look for other ways to discourage scratching. Alternatively, if you have an indoor cat or one that isn’t likely to get into these situations outside, then it can be reasonable to trim their claws enough to limit the furniture damage without affecting their lifestyle in any significant way. Helen, that’s a great idea thanks!